The CoffeeSnobs USB Temperature Data Logger has now been replaced by a smaller, neater device called HeatSnob. 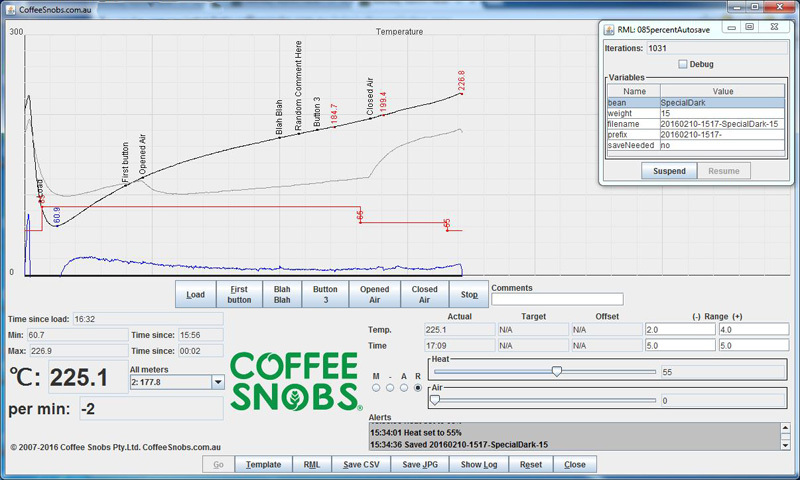 HeatSnob works with CoffeeSnobs Roast Monitor software and Roast Monitor will work with a mixture of HeatSnob units and the previous meters. You can run up to 9 temperature monitors although 2 or 3 is enough for most people. Bean temperature, air temperature and exhaust temperature are the 3 most common areas to monitor but you could also add cooling tray or ambient temperature if you can use that data too. This meter and software has been installed on 1000s of different PCs all over the planet and everyone I know that run it are getting much more consistent results using this logging and replicating. Mac? I have been told that it works fine using Parallels for Mac. Linux. Sorry, but I doubt it will run on Linux until Sun Java gets a working USB library for Linux, Mac and Windows. You can scrounge an old PC for next to nothing these days. *The hardware requirements of the software is very low and it will run on just about any Windows PC with a USB port. *Finding an old notebook (with 1024px resolution) is often a great way to use this roasting tool. This is a true plug and play hardware device, Windows automagically loads its own driver for it and it appears in Device Manager as a HID without mucking about with serial device driver files and having to know baud rates and com ports. The USB Temperature Datalogger is available in BeanBay "Other Stuff" now. After downloading, run the installer and follow the simple prompts. This will make future updates cleaner and easier, leaving the previous profiles and settings and only updating the program. This excellent user guide was put together by CSr GrahamK for the older meter version but should help new users and existing ones get up to speed with the features pretty quickly. Detailed revision notes are included in the download. 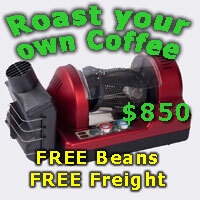 This would be a great time to remind people that this software is written for me to use with the commercial roaster at the Snobbery and it has been working perfectly for up to 50 roasts per week, every week of the year for years. While I'm happy to share it with CSrs for free and welcome new ideas please understand that if I cannot see a benefit in a requested feature or think it would hinder my usage then I won't want it in the software. 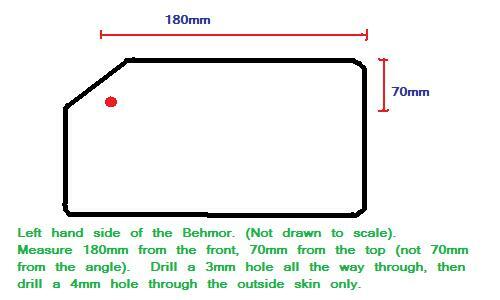 A template for mounting the stainless thermocouple in the Behmor1600 is below. Please Note: we will clean this thread from time to time and update any new information in this first post to avoid confusion when a new version is released. Last edited by Andy; 9th May 2018 at 03:06 PM. Reason: new version and slightly more current screen shot. Javaphile, doobs, DaveD and 1 others like this. When you install the Heatsnob the first time Windows will try and find a "plug 'n pray" driver for it. You should see the installation icon the bottom right of the task bar, opening it will show the following. 1: It will try and get an updated driver for "HID Thermocouple" from Windows Update, you can wait for the time-out or better still, click on "skip obtaining driver software from Windows Update"
Because Windows never trusts you, it will also ask you to confirm the click. Answer Yes. It will then go ahead and install the driver you already had on your machine. You can click Close when it's done. How do I change the Heatsnob to Farhenheit? Also how much of the probe should be in the bean mass? I did a roast today and I have the probe set really low in my breadmaker to ensure that it stays within the bean mass and I can only have about 4-5mm of the probe in the pan to keep it from getting hit by the mixing paddle, and I only hit 141 Celsius during the roast, despite hitting first crack at 6 minutes. . .
# Temperature scale - either Celsius or Fahrenheit. You need to spell it right too! Probe? The tip reads the temperature but if the probe is a tight fit then it will act as a heat-sink and give you the temperature of the metal it's going through. You can also use the "multiplier" in the preferences file to calibrate your setup... or calibrate the probe to boiling water. Are the slider min/max values user adjustable? Or can they be replaced with presets? Not user adjustable but they are 1-100 so you can plot percentages... which is also perfect for plotting manual Behmor buttons as P1=0% P2=25% P3=50% P4=75% P5=100%. Is there a way to manually capture other values, eg entering A and B temps? The comments field allows you to type something in, it gets tagged on the primary plot line and also added to the CSV file so you can see/use it later. You can also change the value of the 5 buttons if its something that you find yourself typing a lot. In your example it might make sense to have a button called "P5 Manual" instead of "Rolling Second Crack" and that way you can plot on the line when you use it. Also, is there a way of loading the csv file with the colours active, if loaded as a template it is all green ready for next roast. # Colour of template display (RGB 0,0,0 to 255,255,255). Edit this section in the preferences.txt file to have the 5 buttons become a shortcut for whatever you like. # Text for tag buttons. I'll keep an eye out in Beanbay for the probes to come back in. I'm in Indonesia just bought 3kg roaster, classic drum. It seems having problem in temperature reading on CoffeeSnobs software (Roast Monitor). I noticed some alerts on Roast Monitor that thermocouple shorted to power and can't read the primary meter. Also there is huge disparity temperature reading between Autonics TCN4S and in the Roast Monitor. It shows right temperature while in Roast Monitor shows up in thousands degree Celcius. I've tried reinstall Roast Monitor but still occurred the same. Last edited by gilangpram; 10th May 2017 at 12:55 PM. Remove the probe from the roaster and test it on your desk (insulated). Let me know if Roast Monitor works okay then. It sounds like a voltage leak on your roaster. If your temperature drops fast it will plot a blue temperature, if it rises fast it will plot a red one. Is there a way to turn this function off? It's possible to roast with one temperature when you drop the beans in, one at the turn and one when you drop the beans out. The bottom left "Target field" will change colour to show too hot, too cold and goldilocks just right. I had not tried to edit/view/open the .csv files, i'd saved a roast in RM in .csv, and then tried to load it as a template. If you open in Excel and save it the columns can shuffle, blame Microsoft not us! Upload one of your saved templates (saved from Roast Monitor, never viewed in excel) to this thread so we can test it. Is there a video with the heatsnob and software doing a roast? Don't know. Is there? I think it would be a pretty boring 20 minute video though! I'm reading this RML and its kinda a killer for me... I'm still learning the basics. 2 questions. 1. Is there any way to increase the size of the ROR or rate of change axis so it looks bigger. 2. with the smoothing - whilst 10 is the default... mine with a few roasts is showing a lot of "saw tooth". anyway/suggestion to make it smoother? Edit it in notepad, the temperature scale (vertical) and the time scale (horizontal) can both be changed easily. # Temperatures (vertical scale) in degrees. # Horizontal scale in minutes. 2: Smoothing. Also set in the preferences.txt file. Post a saved JPG of one of your roasts so we can see what you mean. Appreciate if anyone can help out! thanks folks. Took half an hour of head scratching (and a little swearing) but I found the problem. Has a comma in the note which then added another column to the CSV. Removed the comma and it works fine. ...will also talk to the developer to see if we can strip commas from the note field in a future version. Dimal, magnafunk, Janus and 2 others like this. I've been running that live on my roaster for more than a month and can't find any problems so it's now gone live and the download links in the first post will be for version 2.61 now. Version 2.61 is our first multi lingual version. All text in the main window can now be customised by the user. On the first run of RoastMonitor, the file "Translations.txt" is created in Documents\CoffeeSnobs. This file contains a line of the form "English text = English text" for each text element in the main window. The text to the left of the equals sign should not be altered, but text to the right can be modified as required. If modifying this file, you should be aware that this file is Unicode-encoded. Text on buttons can include some HTML tags. A text character surrounded by <u> and </u> will be set as a keyboard shortcut for that button; <br> will force following text to a new line. For consistency, the previous customisation of some buttons via Preferences.txt is no longer supported. If you want to see translation in action, replace Documents/CoffeeSnobs/Translations.txt with the below spanish content. When you've finished playing you can delete Translations.txt and a pristine version will get created next time you run. I'm happy to keep a library of translation files either here on CoffeeSnobs, on HeatSnob.com or in the software package so if you make one you like, let me know. Dimal, Javaphile and 338 like this. HeatSnob on a Mac --- discussion moved to it's own thread. Heatsnob has gone a bit haywire, very rough line and bouncing around a lot. Roasted 4 batches tonight, the first 3 it worked fine then the last it did this. Have checked the leads, nothing seems to be out of place. Occasionally i'll get some strange spikes that even out pretty quickly, however this time it was wonky the whole roast. I can see in your screen-shot it says what the problem is "Thermocouple shorted to power"
So something changed on your electrical circuit. Try running the notebook on battery should stop the message. To troubleshoot, turn off the fan/heater/washing machine/aircon whatever it was on that power circuit that you turned on during the 4th roast. 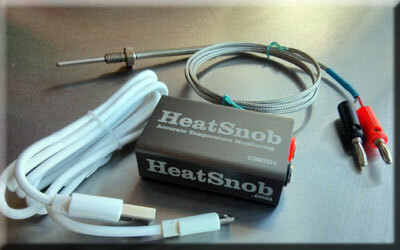 The Heatsnob and thermocouples are good at "seeing" small voltage differences and will report leaks to earth or power. It's not a problem with the HeatSnob or probe, it's something else in your roasting setup or house. You can insulate the probe from the roaster and the problem will be hidden but finding the actual problem is a better solution. New Version of Roast Monitor Released Today. When we moved the forum from HTTP to HTTPS we "broke" the Roast Monitor version check. All fixed in this version. Download version 2.62 from the links in the first post. Thanks Andy, i only run the laptop on battery when roasting, i'll have a closer look and make sure the wires are seated in the connectors properly. Heatsnob working A.ok again, must have been a poor connection somewhere. Again, please read post 16 above. Shorted to power error message really means that the HeatSnob could see a problem, not it had a "poor connection somewhere". Clothes dryer, air-con, compressor, pop-up toaster... something on the same circuit is "leaking" power sometimes. Don't be surprised if the problem comes back and it's not the HeatSnob causing it. You can easily identify what else is on the same power circuit by turning off that specific power circuit at the electrical meter and then seeing what doesn't work in your house. Hi Andy, thanks I understand however I don’t have the computer plugged into the mains when I roast so don’t believe this could have been the issue? Yep, it was my wife's vibrating exercise platform, she turned it on mid way through a roast last night and the readings went haywire. Thanks for the assistance. Nice to know I know what I'm talking about (sometimes at least). Those symptoms are always a different appliance on the same electrical circuit as the HeatSnob computer. I do appreciate you letting us all know. You might want to get the "vibrating exercise platform" looked at by a sparky. It might be a suss plug-pack or similar that's leaking voltage that the Heatsnobs sees. Better to be safe than sorry. Thanks I’ll look into it. For the record, the computer is not plugged in to mains while i roast, only the roaster is plugged in. ;-), ;-), ;-).... say no more! Andy and simonsk8r like this. Can I plug the probe into just a normal multimeter? Not enough information to give a better answer. Most "normal" multimenters don't do temperature, if your multimeter does temperature then its likely but not guaranteed the probe will work. Yeah, think I'll just get the heat snob. I've got an old PC kicking around too. I'm using a correto setup. Is there a 'best position' in the bread maker? I tried installing the heat snob thermocouple into a Behmor 1600 plus , with Andy's original instructions (drill 3mm hole all way through, drill 4mm outer case only), I couldn't fit the probe in. The probe itself is 4mm diameter.. but that means it won't fit though the 3mm hole inside the chamber... am I missing something here? and how is the probe fixed onto the outside case with the m6 thread? I currently have the long probe 100mm, should I order the short 25mm probe? justacuppa, I have three probes here (2 x 100mm and 1 x 25mm) and upon measuring all seem 4mm. Maybe the probe size has changed since the instructions were written? Would just drilling the 3mm hole out to 4mm be the way to solve the problem? Maybe a 5 or 5.5mm in the outercase and either tap or use the probe to tap an m6 thread? Bang on. I was wondering if Andy or anyone else had installed one on a coretto and where they placed it to get a good reading? Others have used a bead type TC fed down the side of the pan and through a hole int the side..
Last edited by flynnaus; 24th August 2018 at 09:46 AM. I still have a corretto but not in use. It has a modified Breville single loaf bread maker and I drilled a hole through the side and into the corner of the square based pan where it is least likely to be hit by the agitator. Mine still in use. Did exactly the same thing. The "best" location actually depends on the batch size you decide to settle on and the volume/shape of the bread-pan. To work this out, load up your bread-pan with beans until you notice that agitation starts to become sluggish. 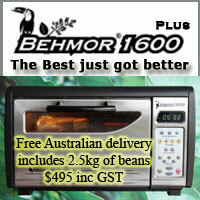 Reduce the batch size until vigorous agitation is restored then weigh the beans. Adjust the batch up or down until you reach a simple weight - 500g, 600g, etc. With the weight decided, put the beans back into the bread-pan, level off and mark the height of the beans on the inside of the bread-pan. Identify a location that will clear the kneading paddle plus be as far from the heatgun air blast, and then drill a hole ~30mm below the batch height level you marked earlier. This will give you a reliable position from which to measure the bean-mass temperature and be comparable to the majority of recordings made in drum roasters. Have determined this via a lot of experimentation and cross referencing. You can of course, adjust the vertical position of the drilled hole(s) to suit different batch sizes. flynnaus, noonar, magnafunk and 1 others like this. Andy , Is this heatsnob coming back in stock ? The factory is building our next batch right now and there was some lag with the mob that does the aluminium extrusion case but it's still happening. Use the [Contact Us] on the site to get added to the notification list, we'll let you know when I can touch them! HeatSnobs are back in stock! This new model is functionally the same but we have changed the original micro-USB to a USB-C type plug which works either way up (as used by Samsung, Nexus etc). A high quality, cloth covered USB-C to USB cable is included along with the stainless braid thermocouple.